What is it: A spinoff of the popular slice-of-restaurant-life comedy Working! 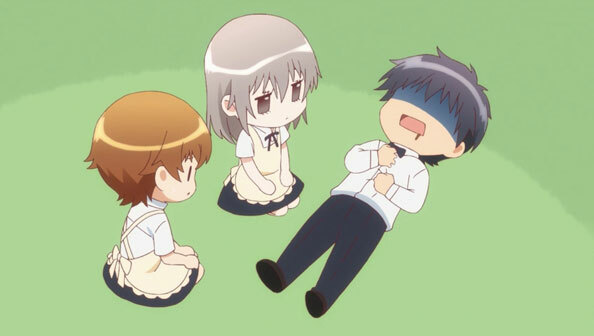 !, with an all-new cast at an all-new branch of Wagnaria. High schooler Higashida Daisuke is forced to get a job at the restaurant when his dad’s business goes bankrupt. Like the previous iterations of the show, his fellow employees are weirdos in one way or another. Why you should watch: If you enjoyed the previous Working! !s like I did, you’ll enjoy this, and possibly even appreciate the refreshed cast, since we’ve had three seasons of the original cast and there weren’t too many stories to tell. 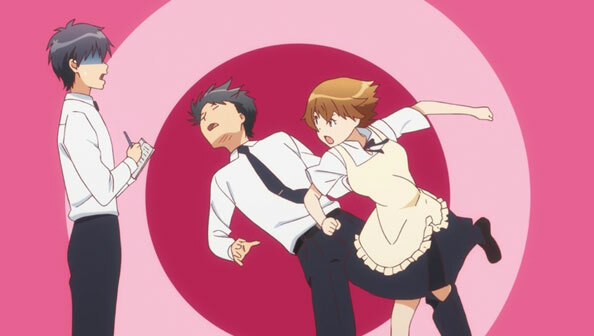 Unlike Servant x Service, the nearly-identical restaurant setting eases our transition into this new show. It’s also packed with star voice talent, from Nakamura Yuuichi to Tomatsu Haruka and Hisaka Yoko. The comedy style is familiar, with rapid fire jokes and absurd situations and conversations. Each character acts and reacts differently to the bland protagonist, and he and Tomatsu’s Miyakoshi Hana (the unflappable high school floor chief who may not carry a katana but packs a mean punch and makes hallucinogenic chocolates) have an easy instant chemistry. The cast includes a lazy college student who likes to quiz people on obscure history, a feckless manager who’s terrible at math, and a rich girl who arrives in a Rolls-Royce and tries to solve every problem she encounters with fat stacks of cash (usually successfully). Why you shouldn’t watch: If you’ve had your fill of Working! !, or just aren’t on board with a new cast, many of whom share traits with the originals, you may not need this spin-off. Animation isn’t any worse than the previous shows, but it’s not any better, either. Like those shows, any serial progress will likely be slow, although this time misanthropy won’t play a huge role, thankfully. 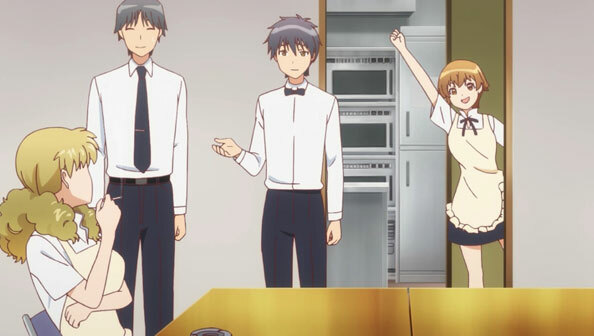 The Verdict: We’re in familiar territory with WWW.Working! !, but there’s more comfort in that than disappointment. All of the new characters are likable right out of the gate, and there’s a lot of potential for both serial development and episodic wackiness going forward. As a low-stakes, low-effort workplace comedy, I rate this show highly watchable, with a good chance of recommendedness. This one didn’t grab me. I think the characters just felt too familiar to be fresh. I actually couldn’t remember if the manager and Miyakoshi Hana were in the original cast but drawn differently. It wasn’t bad and I do not have any particular complaints. It’s just been there before territory. It did seem odd at first to introduce a new cast at a new Wagnaria location but have some characters share traits with the previous cast. But when I thought about it, it’s all too appropriate for different locations of the same restaurant chain to independently breed staffs with oddly similar traits/quirks. Convergent Evolution, maaan!